WASHINGTON (Oct. 27, 2010) -- Soldiers can look forward to increased time at home station when the Army has all but completely pulled out of Iraq, leaving a larger pool of units free to do rotations in Afghanistan. But those rotations will continue for a some time, said the Army's top Soldier. "This war is a long-term ideological struggle against violent extremism, and our job is not done yet. This war is a long way from over," said Chief of Staff of the Army Gen. George W. Casey Jr.
Chief of Staff of the Army Gen. George W. Casey Jr. spoke Oct. 26 during the "Eisenhower Luncheon" at the Association of the United States Army's Annual Meeting and Exposition. He used the opportunity to provide an update on the status of the Army, including efforts to put the force back in balance and what Soldiers will be doing back at home when they are not deployed. Casey spoke during the "Eisenhower Luncheon" at the Association of the United States Army's Annual Meeting and Exposition. The chief spoke to an audience of several thousand Soldiers, civilians, and foreign military members. He used the opportunity to provide an update on the status of the Army, including efforts to put the force back in balance and what Soldiers will be doing back at home when they are not deployed. 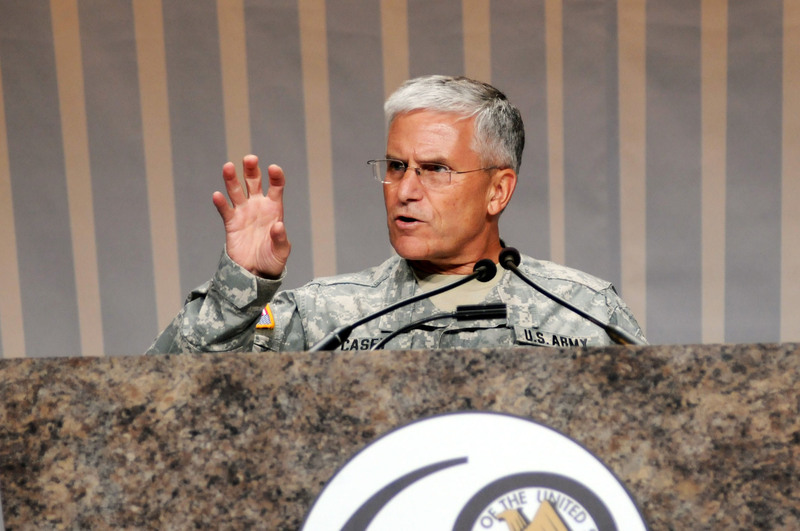 By 2012, the chief said, the Army will have enough Soldiers available to train for missions beyond counterinsurgency. They will be able to return to training and preparing for full-spectrum operations. "We'll have about as many brigades available, but not earmarked for Iraq and Afghanistan, as we will have deploying," he said. "Those that will not be deploying for 12 months will not be sitting on their duffel bags in the barracks. Those not going will be given a training focus for a combatant commander and be available to them for engagement or exercises." It's both the drawdown in Iraq and growth of the Army that will enable it to give Soldiers more time at home, more time with family, and more time to train, he said. The Army has grown by about 95,000 Soldiers since 2007, including some temporary growth, Casey said. "That growth, plus the drawdown in Iraq, is what's allowing us to continuously improve the time our Soldiers spend at home, to improve our dwell," he said. And as I've been here, it's become clearer and clearer to me that the most important thing we can do to restore balance to the Army is to increase our dwell, to increase the time our Soldiers spend at home." For about five years, he said the Army deployed at one year out and one year back. "That was absolutely unsustainable" he said, adding that it takes 24-36 months to recover from a one-year combat deployment. "When you turn faster than that the cumulative effects build up faster." Soldiers freed from grueling deployment cycles to Iraq and Afghanistan under the Army's Force Generation model will be readying themselves for other conflicts that involve a different array of enemies and capabilities, Casey said. Such training has already begun at Army combat training centers. The 3rd Brigade, 82nd Airborne Division, for instance, recently trained at the Joint Readiness Training Center at Fort Polk, La. "They are conducting the first full-spectrum rotation there in quite a while and I had the opportunity to sit in the grass and listen to a company after-action review and sit in a van and listen to a battalion AAR," Casey said. Casey said he was struck by the fact that Soldiers hadn't, for a while, trained the way the Soldiers at the JRTC were training. "It was clear that we need to rebuild our appreciation for the ground -- a lot of good learning going on," he said of the experience. Secondly, he said, he was impressed at the skill Soldiers displayed in Fort Polk. "We are very, very lethal at the company and platoon level," he said. "When these guys closed with the enemy, they were dominate." Casey also took away from the experience insight into young Army leadership -- hungry to do better and develop warfighting skills. "These leaders who had been up for 36 hours preparing a defense -- some of the lieutenants you could tell they had dug their own foxhole -- and they are sitting there discussing amongst themselves how they can get better at doing what they are doing," he said. Soldiers prepared with such training can expect to go on to serve in other combat missions that are not in Afghanistan, Casey said. "The combatant commanders outside of Central Command have been waiting for you, and you will be received with open arms -- and used," he said. Casey also said that after nine years of war, the Army may have changed, and that it needs to understand those changes to go forward. "The impacts of war have changed us as individuals, as professionals, and as a profession in ways we don't yet fully appreciate," he said. "For us to succeed as an Army ... it is imperative we gain an understanding of how a decade at war has affected us personally and professionally." The general said he has asked the director of U.S. Army Training and Doctrine Command to conduct a study to find what has changed in the Army as a result of two wars spanning nearly a decade.